A one-off collaborative event exploring what it means to grow up and grow old with rave culture in Greater Manchester, curated by Beate Peter. 'It's Alright' will be an immersive experience with curated spaces dedicated to celebrating different aspects of the rave scene. 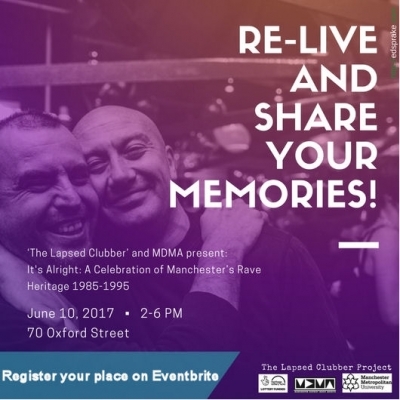 You are invited to join a panel discussion, share your memories and listen to tunes by some of Manchester’s finest DJs, all of that whilst jointly mapping out Manchester’s rave culture between 1985 and 1995. Representing very different eras and club cultures, we are chuffed to have DJs Hewan Clarke (Haçienda), Rob Fletcher (Herbal Tea Party), Andy Harris (Havok) & Aniff Anikola (Chapter & The Verse, co-writer of Voodoo Ray) spinning their top tunes from 1985-1995. Panel: DJ/radio prodcuer Kath McDermott (Flesh/Paradise Factory), DJ/radio host Hewan Clarke (Hacienda/Gallery/Berlin) and DJ/record retailer Russ Marland (Spin Inn/Hacienda/Vinyl Exchange). We will be documenting your memories of the places, music and the moments that meant the most to you. All of this will be captured for an exciting new research project led by Manchester Met and Manchester District Music Archive, details of which will be unveiled at the event. In addition, we'll be hosting the exclusive launch of Manchester District Music Archive's brand new device-responsive website, part of our current Heritage Lottery-funded project ‘Rebel Music: The Sound of Politics & Protest in Manchester’. MDMA curator Abigail Ward will be delivering a presentation in the old Cinema 3. Come and relive your memories of good music, great people, and a strong community!